Oriental rugs are treasured investments that enhance your home’s beauty. When getting your cherished rugs repaired, you want to trust an experienced restoration company, a company that will stand behind its work and meet your oriental rug’s structural and cosmetic needs. For over 30 years, KIWI has earned customers’ respect and loyalty by giving the highest quality work and delivering on our promises. 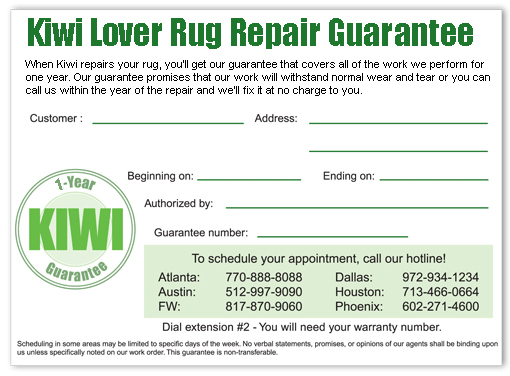 At KIWI, we stand behind everything we do and that’s our promise with our One Year Rug Repair Guarantee. When KIWI repairs your rug, you’ll get our guarantee that covers all of the work we perform for one year. Our guarantee promises that our work will withstand normal wear and tear or you can call us within the year of the repair and we’ll fix it at no charge to you. KIWI’s One Year Guarantee is a promise and assurance of quality work that will stand the test of time. However, as much as we’d like to make your rugs indestructible, our guarantee does not cover new damage from pets, fringes caught in the vacuum and unusual wear and tear. 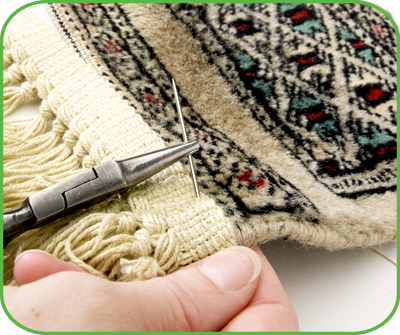 Protect your rug with KIWI’s rug repair guarantee when you have your beautiful rug repaired. We hold the quality of our rug repairs to the highest standards so you’ll know your rug will last a lifetime. Trust KIWI and live freely with the One Year Rug Repair Guarantee. Call us today to get your rugs repaired and guaranteed with KIWI.